From the Bangkok Post June 3, 2004. Download as a PDF file. 'It all started when I was very little. As I was my grandmother's beloved nephew, I was much closer to her during my childhood than my brothers and sisters. 1 noticed she was always accompanied by a betel set almost everywhere she went. The blood-coloured juice that covered her teeth, and the munching noise she made was something 1 remember so vividly from that time. I noticed that her complete betel set included a small, sharp-edged gadget used for cutting the fresh betel nut into bite-sized pieces. It was a betel cutter. The one she had was a very simple knife, with no elaborate design or sophistication. Little did I know at the time that this item would become a source of pride a joy for me when I grew up. The culture of betel-chewing was regionally popular ranging from India to Southeast Asia. In Thailand, there's no hard evidence of how and when this habit was adopted to but it seemed to have declined under the rule of former Prime Minister Gen. P. Piboonsongkram, whose nationalism and extreme Westernisation policy condemned black, betel-stained teeth as old-fashioned and uncivilised, and betel-chewing was eventually banned. As time went by, the habit of chewing betel continued to slowly disappear not only in Thai society but also all over the region including Java and Bali in Indonesia as well as in Malaysia. I saw this decline as a sign to start collecting these items. I'm really into any kind of antiques. If utensil demands decrease, there'll be no supply. That's basic economic theory. It means the producers will simply stop making new ones, and existing objects could become priceless one day. My first piece in the collection came from Nakhon Si Thammarat in southern Thailand. It's a singha- (lion) shaped cutter, outstanding because of its authentic Thai handle. But it's not as flamboyant as the ones 1 bought from Indonesia. When 1 journeyed to Java in 1994, 1 came across other pieces of hinged two-bladed instruments in the shape of animals such as a horse, bird, rabbit, lion or even in human shapes, with gold and silver inlay. Every design distinguished itself from another, which made every single piece so interesting to me. My favorite piece is also made in Java. It's singha-shaped and inlaid with golden wire. Spectacular. The work from Malaysia is so different. Due to different religious beliefs, the betel cutters were instead skillfully crafted in flower designs or were guillotine-shaped. In Burma, there are still a number of people aged over 50, chewing betel nuts. It's the place where I can find brand new cutters, but they won't look the same in many ways. Most of my collection came from Indonesia because betel cutter designs seemed to fulfil their highest potential there. Plus, the Indonesians like their betel hard, and that required a cutter to crack it down. The utensils were widely used throughout the country. That's why, over the centuries, this small simple gadget has been artfully developed into somewhat exceptionally-refined styles for commoners and that of the royal families. I found most of these cutters in antique shops while some were discovered at Chatuchak weekend market. People overlook them without realising their worth. In one particular case, however, an old woman in Java walked towards me and asked if I would buy her betel cutter. I bought it without hesitation. At a visit to our local market, 1 saw a beautiful cutter lying in a wicker basket and I decided I was going to buy it later when 1 walked back. Once I returned, it was gone with a foreigner already, which really upset me. Another type of beauty and charm of the betel cuttter, I guess, is kram, a technique using gold or silver thread inlay on steel. Its fine inlaid handle always reflects the superb workmanship of Asian older generations of skilled artisans that is hard to find nowadays. Since they are collectors' items, their prices are a bit high. I bought some pieces in US dollars 10 years ago, and I believe they'd cost me much more if I bought them at today's market price. Some pieces were contributed by my friends from when they travelled around. So they were free to me but priceless in my heart. I think there are a few collectors who admire the beauty of this small utensil like I do, though most of them seem to be Westerners. The only book I have on the subject is Betel Cutters from the Samuel Eilenberg Collection, featuring his I87 fine examples. 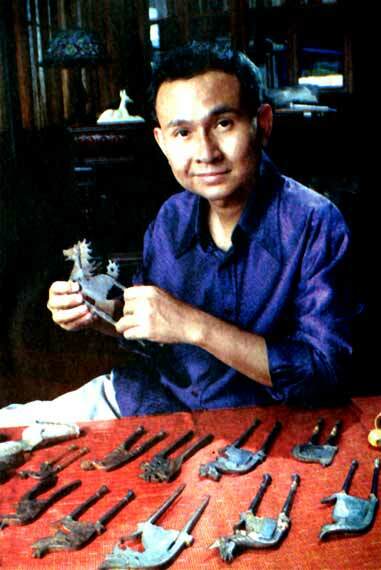 He collected the cutters for almost 40 years. It is such a shame that although the betel-chewing habit is in our Asian culture, it is outsiders who, study and collect our precious heritage." Amicha Teerakanont's favourite Singha-shaped betel cutter from Java.